Protect Your Cards 6/5/12 | Sorcerers Of The Magic Kingdom: The Blog! I have to admit I get a kick out of people who walk around with huge trapper keepers & binders filled with spell cards. However their cards are always in immaculate condition and those are the folks you want to trade with. Well what about your cards? Are you one of those people who walk around with your cards out-of-order and crammed into your pocket? If you are you’ll probably find it difficult to trade with other sorcerers. Why you ask, well it’s pretty simple no one wants your creased, ripped & sometimes sticky spell cards. These cards have become highly collectible and people want them in as mint condition as possible. Here are few inexpensive items you can purchase online or at many retailers such as Wal-Mart, Target, & Toys R Us. If you don’t feel like spending any money on accessories like these at least store them in a Ziploc bag. Otherwise you can’t be upset if someone refuses a trade due to the poor condition of your cards. Can you blame them? Call me crazy but I certainly wouldn’t want any cards dredged in turkey leg slime. 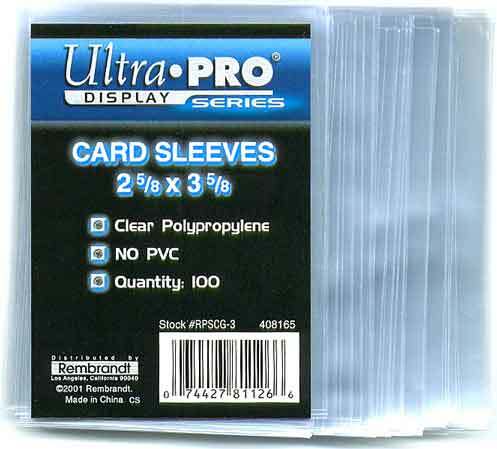 These card sleeves can be purchased for $1. These are great to use with the deck box! 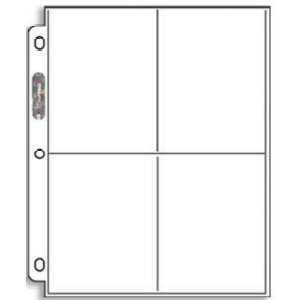 These 4 pocket pages will fit in any small binder you’ll find at an office supply store. Plus it’s great for casting multiple spells. I was unable to find any 2-ring Binders at OfficeMax. You want the smaller 3 ring I’m not sure of the dimensions but I know Staples has them. We picked up or “Monster” card protector book at our local comic book store. Each page holds 4 cards and it’s well made and compact. Love my deckbox! I had them in a 3×3 baseball protectors but felt it was cumbersome for the park.